Lawn grubs are the immature form of a variety of scarab beetles. 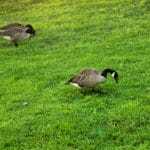 They feed on grass roots, which is why you might find some spots in your yard mysteriously dying—especially during the early fall when they feed the most. It’s important you actively work to get rid of grubs because once they grow into their mature, beetle form, they will lay more eggs, and the cycle will begin again. Here are a couple home remedies to get these pests out. If being environmentally safe is important to you, this microbial-based product is a great option. 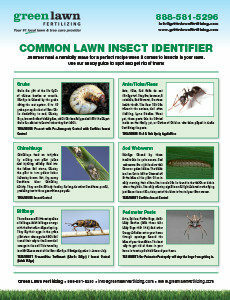 Just apply milky spore to the affected lawn areas where grubs are feeding. As the grubs digest the spores, it infects and kills them. Then, as the grubs decompose, they release additional spores into the soil and infect the other grubs, preventing the infestation from spreading. This oil-based pesticide is derived from Neem trees. Its insecticidal properties repel both Japanese beetles and lawn grubs. To get rid of grubs with Neem oil, mix with water and apply spray treatments once a month during the summer. 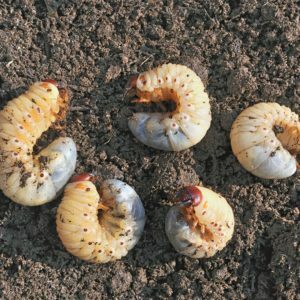 It works by preventing lawn grubs from laying eggs, growing, and feeding. Did you know you can fight pests with another form of pest? 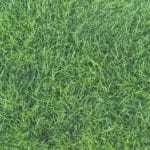 Instead of using chemicals, you can spray affected areas of your lawn with nematodes, soil-dwelling worms. Their bacteria infects and kills lawn grub populations. You can purchase nematodes in liquid form or solids that you mix with water. Don’t let your lawn become the perfect snacking ground for grubs. The friendly neighborhood lawn technicians at Green Lawn Fertilizing are here to help. 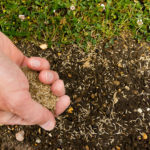 We know how to get rid of grubs the natural way to prevent you from experiencing the problems associated with lawn grubs. 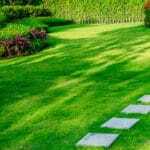 Give us a call today at 888-581-5296 for a free lawn-care estimate.